To report a MediaWiki error on Wikipedia, see Wikipedia:Bug reports. A software bug is an error, flaw, failure or fault in a computer program or system that causes it to produce an incorrect or unexpected result, or to behave in unintended ways. The process of finding and fixing bugs is termed "debugging" and often uses formal techniques or tools to pinpoint bugs, and since the 1950s, some computer systems have been designed to also deter, detect or auto-correct various computer bugs during operations. Some software bugs have been linked to disasters. Bugs in code that controlled the Therac-25 radiation therapy machine were directly responsible for patient deaths in the 1980s. In 1996, the European Space Agency's US$1 billion prototype Ariane 5 rocket had to be destroyed less than a minute after launch due to a bug in the on-board guidance computer program. In June 1994, a Royal Air Force Chinook helicopter crashed into the Mull of Kintyre, killing 29. This was initially dismissed as pilot error, but an investigation by Computer Weekly convinced a House of Lords inquiry that it may have been caused by a software bug in the aircraft's engine-control computer. Isaac Asimov used the term "bug" to relate to issues with a robot in his short story "Catch That Rabbit", published in 1944. A page from the Harvard Mark II electromechanical computer's log, featuring a dead moth that was removed from the device. The first documented use of the term "bug" for a technical malfunction was by Thomas Edison; In the year 1878 he mentioned the term in a private letter. The Computer Fraud and Abuse Act, the Digital Millennium Copyright Act and the Electronic Communications Privacy Act criminalize and create civil penalties for actions that security researchers routinely engage in while conducting legitimate security research, the report said. However, even with the aid of a debugger, locating bugs is something of an art. It is not uncommon for a bug in one section of a program to cause failures in a completely different section, thus making it especially difficult to track (for example, an error in a graphics rendering routine causing a file I/O routine to fail), in an apparently unrelated part of the system. Some bugs are revealed by inputs that may be difficult for the programmer to re-create. One cause of the Therac-25 radiation machine deaths was a bug (specifically, a race condition) that occurred only when the machine operator very rapidly entered a treatment plan; it took days of practice to become able to do this, so the bug did not manifest in testing or when the manufacturer attempted to duplicate it. Other bugs may disappear when the program is run with a debugger; these are called heisenbugs (humorously named after the Heisenberg uncertainty principle). ManyBugs is a benchmark of 185 C bugs in nine open-source programs. Defects4J is a benchmark of 341 Java bugs from 5 open-source projects. It contains the corresponding patches, which cover a variety of patch type. Priority controls where a bug falls on the list of planned changes. The priority is decided by each software producer. Priorities are sometimes numerical and sometimes named, such as "critical," "high," "low" or "deferred"; these may be similar or even identical to severity ratings when looking at different software producers. For example, priority 1 bugs may always be fixed for the next release, while "5" bugs may never be fixed. Industry practice employs an inverted scale, so that highest priority are low numbers (0 and 1), while larger numbers indicate lower priority. Deadlock, where task A cannot continue until task B finishes, but at the same time, task B cannot continue until task A finishes. In both the 1968 novel 2001: A Space Odyssey and the corresponding 1968 film 2001: A Space Odyssey, a spaceship's onboard computer, HAL 9000, attempts to kill all its crew members. In the follow-up 1982 novel, 2010: Odyssey Two, and the accompanying 1984 film, 2010, it is revealed that this action was caused by the computer having been programmed with two conflicting objectives: to fully disclose all its information, and to keep the true purpose of the flight secret from the crew; this conflict caused HAL to become paranoid and eventually homicidal. In the 1999 American comedy Office Space, three employees attempt to exploit their company's preoccupation with fixing the Y2K computer bug by infecting the company's computer system with a virus that sends rounded off pennies to a separate bank account. The plan backfires as the virus itself has its own bug, which sends large amounts of money to the account prematurely. ^ Prof. Simon Rogerson. "The Chinook Helicopter Disaster". Ccsr.cse.dmu.ac.uk. Archived from the original on July 17, 2012. Retrieved September 24, 2012. ^ Edison to Puskas, 13 November 1878, Edison papers, Edison National Laboratory, U.S. National Park Service, West Orange, N.J., cited in Hughes, Thomas Parke (1989). American Genesis: A Century of Invention and Technological Enthusiasm, 1870-1970. Penguin Books. p. 75. ISBN 978-0-14-009741-2. ^ Computerworld staff (September 3, 2011). "Moth in the machine: Debugging the origins of 'bug'". Computerworld. Archived from the original on August 25, 2015. ^ "Modern Aircraft Carriers are Result of 20 Years of Smart Experimentation". Life. June 29, 1942. p. 25. Archived from the original on June 4, 2013. Retrieved November 17, 2011. ^ Dickinson Rich, Louise (1942), We Took to the Woods, JB Lippincott Co, p. 93, LCCN 42024308, OCLC 405243, archived from the original on March 16, 2017. ^ "Danis, Sharron Ann: "Rear Admiral Grace Murray Hopper"". ei.cs.vt.edu. February 16, 1997. Retrieved January 31, 2010. ^ "Bug Archived March 23, 2017, at the Wayback Machine", The Jargon File, ver. 4.4.7. Retrieved June 3, 2010. ^ a b "Log Book With Computer Bug Archived March 23, 2017, at the Wayback Machine", National Museum of American History, Smithsonian Institution. ^ "The First "Computer Bug", Naval Historical Center. But note the Harvard Mark II computer was not complete until the summer of 1947. ^ James S. Huggins. "First Computer Bug". Jamesshuggins.com. Archived from the original on August 16, 2000. Retrieved September 24, 2012. ^ Journal of the Royal Aeronautical Society. 49, 183/2, 1945 "It ranged ... through the stage of type test and flight test and 'debugging' ..."
^ staff, Computerworld. "Moth in the machine: Debugging the origins of 'bug'". Retrieved September 6, 2018. ^ "Did You Know? Edison Coined the Term "Bug"". Retrieved September 6, 2018. ^ Wilson, Andi; Schulman, Ross; Bankston, Kevin; Herr, Trey. "Bugs in the System" (PDF). Open Policy Institute. Archived (PDF) from the original on September 21, 2016. Retrieved August 22, 2016. ^ a b c d Rozens, Tracy (August 12, 2016). "Cyber reforms needed to strengthen software bug discovery and disclosure: New America report – Homeland Preparedness News". Retrieved August 23, 2016. ^ "News at SEI 1999 Archive". cmu.edu. Archived from the original on May 26, 2013. ^ Shustek, Len (August 2, 2016). "In His Own Words: Gary Kildall". Remarkable People. Computer History Museum. Archived from the original on December 17, 2016. ^ Kildall, Gary Arlen (August 2, 2016) . Kildall, Scott; Kildall, Kristin (eds.). "Computer Connections: People, Places, and Events in the Evolution of the Personal Computer Industry" (Manuscript, part 1). Kildall Family: 14–15. Archived from the original on November 17, 2016. Retrieved November 17, 2016. ^ Huizinga, Dorota; Kolawa, Adam (2007). Automated Defect Prevention: Best Practices in Software Management. Wiley-IEEE Computer Society Press. p. 426. ISBN 978-0-470-04212-0. Archived from the original on April 25, 2012. ^ McDonald, Marc; Musson, Robert; Smith, Ross (2007). The Practical Guide to Defect Prevention. Microsoft Press. p. 480. ISBN 978-0-7356-2253-1. Archived from the original on December 2, 2006. ^ Le Goues, Claire; Holtschulte, Neal; Smith, Edward K.; Brun, Yuriy; Devanbu, Premkumar; Forrest, Stephanie; Weimer, Westley (2015). "The ManyBugs and IntroClass Benchmarks for Automated Repair of C Programs". IEEE Transactions on Software Engineering. 41 (12): 1236–1256. doi:10.1109/TSE.2015.2454513. ISSN 0098-5589. ^ Just, René; Jalali, Darioush; Ernst, Michael D. (2014). "Defects4J: a database of existing faults to enable controlled testing studies for Java programs". Proceedings of the 2014 International Symposium on Software Testing and Analysis - ISSTA 2014. pp. 437–440. CiteSeerX 10.1.1.646.3086. doi:10.1145/2610384.2628055. ISBN 9781450326452. ^ Sobreira, Victor; Durieux, Thomas; Madeiral, Fernanda; Monperrus, Martin; de Almeida Maia, Marcelo (2018). "Dissection of a bug dataset: Anatomy of 395 patches from Defects4J". 2018 IEEE 25th International Conference on Software Analysis, Evolution and Reengineering (SANER). pp. 130–140. arXiv:1801.06393. doi:10.1109/SANER.2018.8330203. ISBN 978-1-5386-4969-5. ^ Allen, Mitch (May – June 2002). 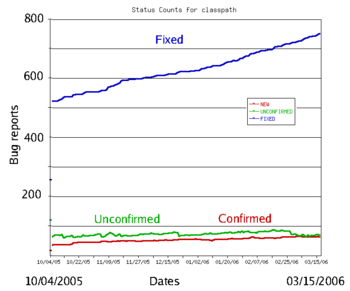 "Bug Tracking Basics: A beginner's guide to reporting and tracking defects". Software Testing & Quality Engineering Magazine. Vol. 4 no. 3. pp. 20–24. Retrieved December 19, 2017. ^ "5.3. Anatomy of a Bug". bugzilla.org. Archived from the original on May 23, 2013. ^ "The Next Generation 1996 Lexicon A to Z: Slipstream Release". Next Generation. No. 15. Imagine Media. March 1996. p. 41. ^ Monperrus, Martin; Bruch, Marcel; Mezini, Mira (2010). "Detecting Missing Method Calls in Object-Oriented Software". ECOOP 2010 – Object-Oriented Programming. Lecture Notes in Computer Science. 6183. pp. 2–25. doi:10.1007/978-3-642-14107-2_2. ISBN 978-3-642-14106-5. ^ Kimbler, K. (1998). Feature Interactions in Telecommunications and Software Systems V. IOS Press. p. 8. ISBN 978-90-5199-431-5. ^ Syed, Mahbubur Rahman (July 1, 2001). Multimedia Networking: Technology, Management and Applications: Technology, Management and Applications. Idea Group Inc (IGI). p. 398. ISBN 978-1-59140-005-9. ^ Wu, Chwan-Hwa (John); Irwin, J. David (April 19, 2016). Introduction to Computer Networks and Cybersecurity. CRC Press. p. 500. ISBN 978-1-4665-7214-0. ^ RFC 1263: "TCP Extensions Considered Harmful" quote: "the time to distribute the new version of the protocol to all hosts can be quite long (forever in fact). ... If there is the slightest incompatibly between old and new versions, chaos can result." ^ Ullman, Ellen (2004). The Bug. Picador. ISBN 978-1-250-00249-5.